If you would like to consider fasting as a spiritual discipline during Holy Week, we encourage you to read the resource page on our website. This is Holy Week, when we remember Jesus' last week on earth leading up to Easter Sunday morning and the celebration of his resurrection. To prepare ourselves for this week, and for Easter, we're sending you special daily personal worship messages. 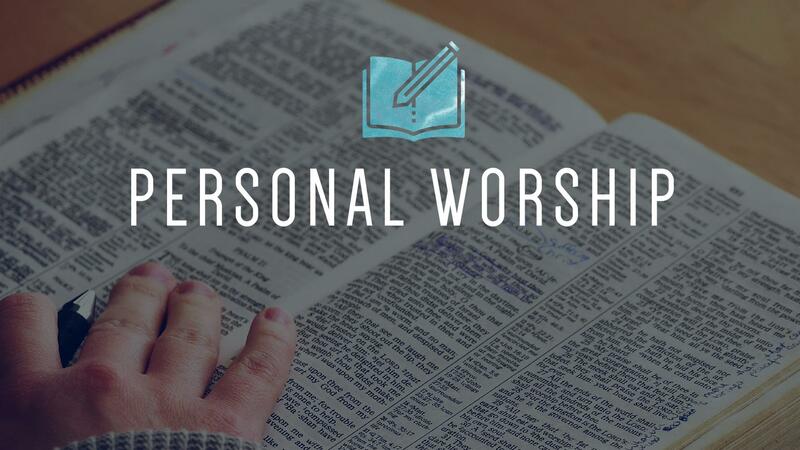 Combined with your regular personal worship Bible reading and reflection questions, this daily time of prayer will focus our thoughts on what we are remembering this week, and make us ready to encounter God in the upcoming special services. Before you begin, take some time to calm your mind. Find a quiet place that is conducive to reflection. If your mind is crowded with things you need to do and are afraid you'll forget, write down the list of things you’re concerned about and then set it aside. You can pick them back up later, but for now your goal is to empty your mind of the chaos of your everyday life. Ask the Holy Spirit to focus your mind, and give you wisdom and clarity. In the next sections, you'll find brief selections from the Psalms. Each Psalm is followed by a paragraph to either guide you through "praying" that Psalm (that is, reading the Psalm while using its words to form a prayer from you to God) or meditating on some aspect of it. Read each Psalm, then either pray through the same Psalm or reflect on the meditation (depending on the guide paragraph). It's a wonderful discipline. As you come to the Lord in prayer this morning, remember that you are his child and your chief need is spending this time with him daily, where he meets with you and renews your heart and mind for the day ahead. Pray these verses above back to him, “God, you are the King of all the earth, you reign over the nations, and I will praise you from my heart this morning! Help me to keep you as the King of my heart this whole day.” Spend time in praise and thanksgiving. As you read the above Psalm, ask God to reveal to you any of the ways your heart has become unclean. Be still as you let him do this. Understand that allowing known sin to stay in your life does create a barrier between you and God, and ask for his forgiveness for it or, if necessary, a willing spirit to desire to remove it. Now that you have given the Lord the place of honor in your heart and confessed your sin in humility, rest in the certainty that you are right where you should be, and know that you can trust him for this day. Why is Jesus Different From Other Religious Leaders? Each of these is the account of the crucifixion and resurrection morning. By reading them in each of the four Gospels, you can notice similarities and differences that may be significant. How is Christianity different from the other world religions? If Jesus is risen, what difference or differences does that make for the world? What about for you personally? If Jesus was not raised from the dead, what difference or differences would that make?